Of all (visual) arts, abstract art is best suited for posing ontological questions about art itself, and because of that, also for accompanying music. Why? Why does abstract art has this property? Because like all (pure) music, which by definition is always abstract, abstract art refers only to itself, not to some dubious outer reality – and this against all attempts to conceive them as conveying ”meanings”. Pohjola Bank Art Foundation’s current exhibition at the Helsinki Music Hall brings together four Finnish constructivist artists: Sam Vanni (1908-1992), Ernst Meth-Borgström (1917-1996), Lars-Gunnar Nordström (1924-2014) and Göran Augustson (1936-2012). It is not a comprehensive exhibition, but definitely a carefully thought-out and thought-provoking one. For the exhibition, constructivist works are defined as ”abstractions based on geometric forms, in which color, form and line have a special role”. 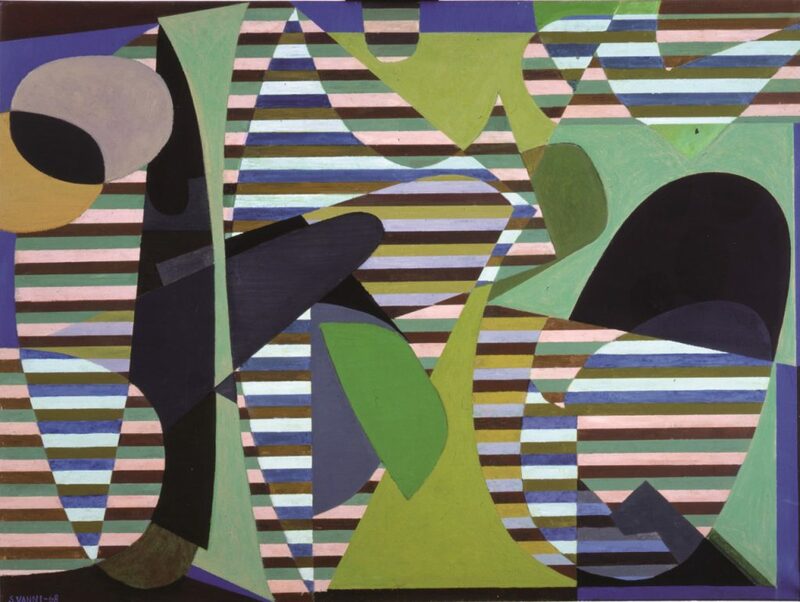 ”Rhythmic variation” of the forms, lines and colors on the image surface are parallelled with ”chords”. Hence the title: ”Chords for Eyes”. Forms transforming into music. ”Chords for eyes” is a good start. Chords are nothing but a bunch of notes played at the same time. Not landscapes, not memories, not emotions. Of course, with a loose language and unclear thinking chords can be taken as representing this or that, but we’re dealing with strictly abstract (stripped-down) entities here, and artists who deliberately wanted to get rid of naive symbolism. Against this background, it is tempting to think that the less the painting offers hints of concrete realities or actual objects, the more musical it is. If this is true, it is no doubt the severely concrete works of Lars-Gunnar Nordström that are the most ”musical”. Of all the works on display, they are the most stripped-down ones, reduced into ”large, geometric shapes divided into planes of color”. His works are prominently two dimensional and very often solely limited to straight lines. Purity and ”poorness” of his works enforce the viewer to a wordless internal talk just like music does. Then there’s the other but different thought according to which music is hidden in the ”movement and rhythm” contained in Nordström’s works. Nordström was a well-known friend of jazz music, and it is not impossible to imagine that the tone and rhythmic patterns of jazz music are at least indirectly expressed in his paintings . How palpable or not this is, is another question. What’s certain is that Nordström himself very much wanted to give the eye a chance to be swept away by the visual process, and the possibility to ”perceive colors and forms in art in the same self-explanatory way people listen to notes and chords in music”. It is much less obvious how Göran Augustson’s “geometric abstractions” (the opening image) could be seen to carry ”musical” connotations. 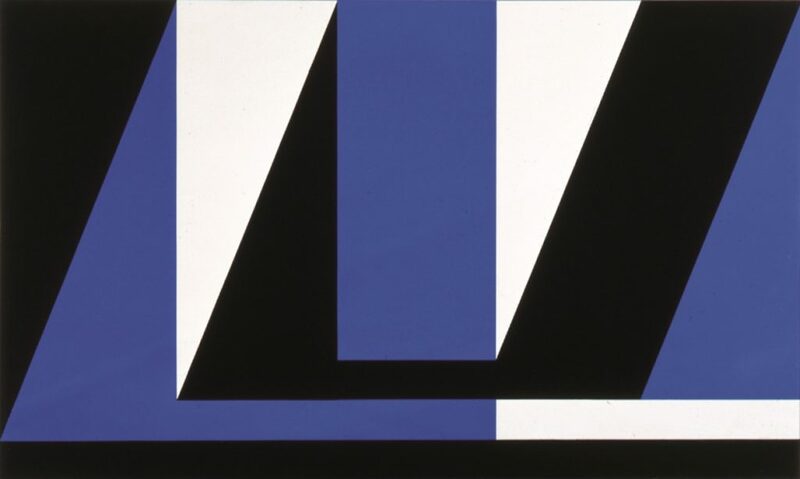 The blue-tinted works feature colored geometric forms of many sort (square, rhombus, triangle) with black contours that seem to stop any movement, and often render them a ”dry” quality. On the other hand, the demarcated surfaces are of different size, some clearly brighter than the others, thereby adding to his works three-dimensionality that in the eyes of a benignant viewer can be interpreted to express, say, certain “harmonies” in music. Are there other channels how abstract art could be expressive of music? It is sometimes proposed that abstract music could be expressive of human emotions by ”imitating” facial expressions of a person who’s undergoing an emotional experience. Now, if this idea could be applied to abstract art, and constructivistic works especially, Sam Vanni’s color compositions and their holographic ”movement” of the lines, could serve as an example. 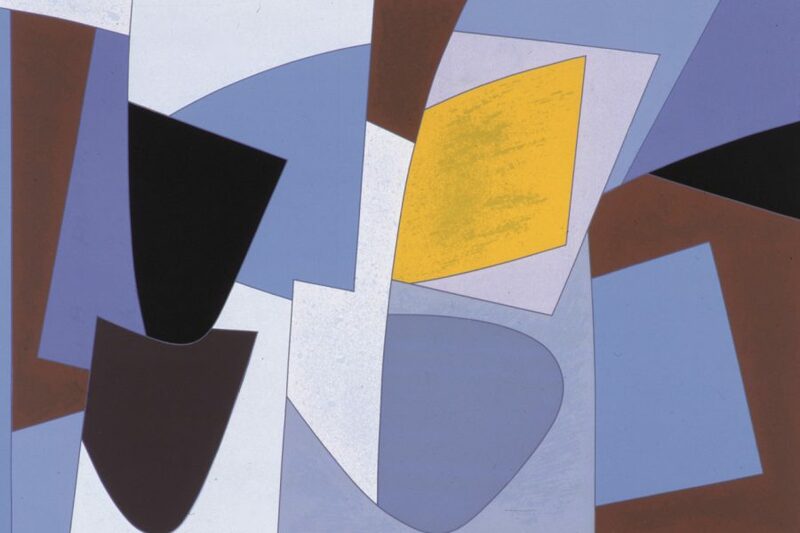 Not surprisingly I found Ernst Meth-Borgström’s ”freely floating shapes” be least ”musical” presumably because an attentive viewer can quite easily spot references that are not pointed to the paintings themselves. The Pohjola Bank Art Foundation has a collection of highly valued stringed instruments which it lends to young, talented musicians. It also promotes Finnish modern visual arts by acquiring works of art directly from their creators, the art collection comprising paintings, sculptures and graphic arts. The Foundation augments its collection every year, making use of experts in the field.